Mexican sunflower, Tithonia rotundifolia, is a tall plant. The genus Tithonia in the daisy family (Asteraceae) includes 10-15 species of bushy annuals, perennials and shrubs native to Mexico and Central America that have large, brightly colored daisy-like flowers on thick stems. Mexican sunflower, T. rotundifolia, is a vigorous, drought tolerant warm season annual that is easy to grow in the ornamental garden with other common names of red sunflower of just tithonia. 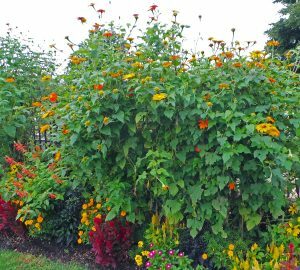 Tithonia plants grow 4-6+ feet tall, with a large central stalk and a somewhat gangly branching habit. The stems can be brittle. The dark green leaves are ovate to deltoid (triangular) in shape, with serrate to crenate margins. The coarse leaves are usually entire but occasionally will be three lobed. The foliage and stems are covered with a soft downy fuzz, and the underside of the leaves are hairy. The foliage of Mexican sunflower is coarse and hairy (L); the ovoid to deltoid leaves have serrate margins and are usually entire (C) but may be three lobed (R). Flowers are produced from mid-summer until frost. The solitary flowers are borne on fragile hollow peduncles (flower stems) that are susceptible to being bent and are often broken by birds. Each 3-inch blossom has a number of bright red to orange ray flowers surrounding the central yellow disk flowers. Thick, fuzzy buds (L) open (LC) to reveal bright red to orange ray flowers (C) surrounding yellow disk flowers (RC) that remain for a while after the ray flowers fall off (R). The flowers are attractive to a wide variety of bees, butterflies and hummingbirds, and can be used as cut flowers. Deadheading spent flowers will prolong blooming. The flowers are followed by grey to black flattened triangular seeds that are easy to collect to save to grow in subsequent years. Many pollinators visit tithonia flowers including (L-R) bumblebee, longhorned bee, another wild bee, syrphid fly, monarch butterfly and tiger swallowtail. 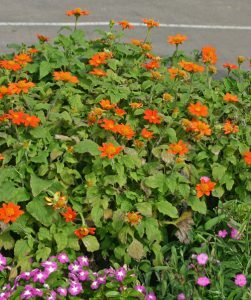 Use tithonia at the back of borders and beds as a backdrop for shorter plants. Because of its tall stature, rangy habit and coarse texture, this annual is best at the back of borders and beds to form a backdrop for shorter plants. It can be used as a seasonal screen (especially if grown from transplants started early in the season). Use in mixed or annual borders with tall zinnias, coreopsis, and other flowers in hot colors for a high-energy planting, or tone down the brilliant orange-red flowers by combining with purple flowers and larger plants with dark-colored foliage, such as annual ornamental millet or castor bean or in mixed beds with woody plants such as smokebush or ‘Diabolo’ eastern ninebark. Tithonia does best in full sun in well-drained soil. 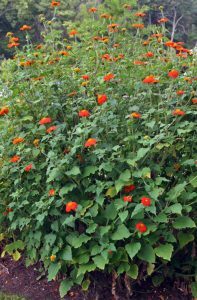 Tithonia grows best in full sun in poor to average, well-drained soil. 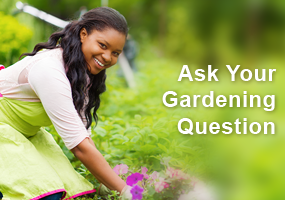 Avoid planting in rich soil or heavy fertilization that with promote excess foliage and weak stems. Pinch back plants to encourage bushier growth and sturdier plants less likely to fall over, but plants often need to be staked to remain upright. Shelter from strong winds if possible. It has few pest problems and is not favored by deer. Grow tithonia from seed, either planted directly in the garden at the last frost date or started indoors 6-8 weeks before the average last date of frost for earlier blooms. Sow shallowly as as light is required for germination. Plant in the garden about two feet apart to provide support for adjacent plants, or place staked plants 3-4 feet apart. Since the plants tall with brittle stems, try to provide shelter from strong winds, but even in areas that are not windy these plants benefit from staking. It needs warm sunny weather to grow well so may not do much early in the season. In cool summers, late-planted direct-seeded plants may not bloom. ‘Fiesta del Sol’ – is a shorter cultivar that only grows about 3 feet tall. It was an AAS award winner in 2000. ‘Goldfinger’ – is a short variety (2-2.5 feet tall) better suited to small gardens with orange-gold flowers. ‘Torch’ – is the most commonly offered cultivar, winning an AAS award in 1951. ‘Yellow Torch’ – has apricot yellow-orange flowers. pollinators – both bees and butterflies love it. We happen to have the full sun and well drained soil requirements that it likes but it really is necessary to start it indoors in WI because of the late start we often get with planting in the spring. I was glad to know the various common cultivars as we have harvested seeds from the previous year and weren’t sure which we had….but, I believe we must have the Torch variety because the plants have typically been in the 4′ range. The only drawback to tethonias is that they have to be planted each year as an annual but the reward is worth it. I’ve been looking for a bold backdrop plant for a very sunny and dry bed, sounds like this would be a good option. Interesting article! I have sandy soil and this is a plant I would like to try. Although this is a pretty flower I must admit I still like the sunflower better. These are just too bushy for my taste at the moment. I do like that they grow in average soil. 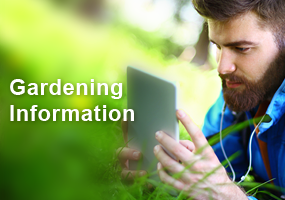 It makes them so much more versatile so they can be planted almost anywhere. Like another commenter, I am “blessed” with clay soils at home. I will think about using this plant as a seed starting activity with my garden club students. Our school garden soil is better drained and it seems like it would do well as a back border plant in our waystation butterfly garden. I did not know they would bloom right up until frost! A great feature, in my opinion! Would like to try the mix with these and zinnias, creating a nice pop of color in an area that is hard to grow anything. I like that the Mexican Sunflower can be deadheaded to prolong flowering. Also it appears that saving seeds for the next year will be very doable. Then colors of this plant are awesome! That’s what attracts me to this plant. Planted several of the shorter varieties in the back of my vegetable garden. The best part is they attract pollinators! Perfect for a butterfly garden. So this is what was planted around the Waupun Post Office a couple of years ago. Beautiful, beautiful, beautiful! The orange blossoms just “pop out’ @ you. I love that it is drought tolerant and deer don’t like it as we have deer using our front lawn @ night to cross the road from a creek to the marsh and back again. Put this one on my list for next year. I’ll keep an eye out for these next year when I’m planning out my garden. On the Floridata website, it does indicate that they can also grow in partial sun – keeping my fingers crossed. I’m going to Lynden this weekend so I’ll be looking for them. Bonus that the deer don’t like them but the pollinators do! I enjoy reading these articles and learning more about the plants and flowers I see in my wanderings. I am going to try the Fiesta Del Sol. Glad to hear the deer don’t like them and the hummingbirds do ! it. I will have to try growing it. These are beautiful, and look like they have the potential to be a real stunner in the flower bed. I will try them in my flower bed next year!! What a great plant to learn about. Most of my garden space is shady but I’m hoping I can find a place to try this. Hopefully the deer in my yard will know that they are not supposed to like it — they seem to eat even “deer resistant” plants! I planted the ‘Torch’ seeds outside in early June. I never thought they would get so tall !! They are about 9 feet high, perhaps because of all the rain we received this season in Southern Wisconsin. I have them well staked! They are visited by Monarchs, Hummingbirds and bees. As my yard is clay soils in many places, it doesn’t seem like this beautiful bloomer would work well – but with some added soil and a wind break area due to the weak stems – i might have to give it a shot. Love the bright vibrant colors. These plants are beautiful in our community garden & make wonderful cut flowers!! Didn’t know they should be planted by seed shallow to allow light to germinate them. I hadn’t heard of these before reading this article. I’d like to try it in my flower garden if I can find a shorter variety. These plants will look great with my coreopsis. I plan to start seeds in spring. This will make a great addition to a pollinator bed—especially since the deer don’t care for them! 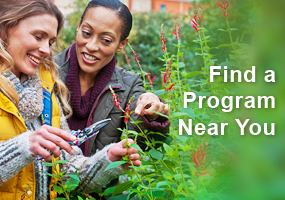 Deadheading will help continue the bloom and keep the garden colorful. Have tried them and they are very beautiful. and easy to grow. Our gardening group has a location that has been named as a Monarch Waystation. Plenty of room to give these a try! This should be a great addition to a butterfly garden and a bonus the deer do not care for this plant. I’ve grown ‘Torch’ from seed indoors and out the last few years. 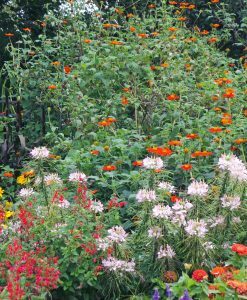 Fabulous – even a few together here and there at the back of the border adds a big pop of color and looks like bright orange butterflies flitting in the breeze. Butterflies love them and deadheading will keep them blooming until they are the last color of the border. I’ve had uneven growth from them some seasons though. I think from the article that it must be a cooler, wetter spring that sets them back. Maybe setting them out later in a chilly spring? These look like a fun flower to grow. I hope rabbits do not find them appealing. In our poor sandy soil (outside Spring Green) they sound perfect. I will look for the shorter cultivars. Can’t wait to try the shorter type. Drought resistant means my water bill can be lower. These are a nice addition to a sunny spot in the garden. I like to combine different varieties of sunflowers. I ‘ve tried to start these from seeds without much success. Probably wrong location. I was able to get an established plant which has been flourishing in a clay pot on my patio. It seems this is the way I can enjoy these plants in my garden. I grow these every year. Start from seed in a flat, usually by May 1st , transplant by June 1st. By mid August until freeze, I have beautiful flowers. I planted 6 this year on the south side of my ranch home and they are beautiful, I bought them At monches farms. Last year was the first time I grew the Mexican Sunflower. It was absolutely amazing to watch the butterflies, hummingbirds, and bees it attracts. I also learned this plant needs space, support and is more delicate than I thought. I planted seeds in a 24” wide bed along the sunny south side of my garage. Soil leans more towards sandy and when the heat of the summer hits the soil dries out quickly and the plant gets overheated from the reflecting heat off of the garage. That area get at least 6+ hrs of sun. They would quickly wilt and yet revive after a good watering. Hence leaves will show the effects of the stress after some time. This year I placed the seeds in a container behind some lower trimmed bushes in front of an east office window. The bush supports the bushy stalks perfectly. The plant provides me with a shaded room, privacy, and a view. I plan on planting these beauties every year! This will be a great addition to my backyard garden against the wooden fence, something tall and vibrant. Deer are plentiful in my back yard so it’s a plus that they aren’t a favorite for them! Always looking for something to attract bees and butterflies and the long blooming season is a plus. This flower is a must for gardens. Although varieties can be tall, using a tomato cage works well to hold the plant upright as it grows. I’ve planted Goldfinger and Torch together, the height difference of these two Tithonia work well together. Have noticed swallow tails consistently on these plants. They make beautiful cut flowers but you do have to be careful not to bend the stem. I planted seeds this spring in late May…the plants are only about a foot tall, hoping I’ll see some flowers before the snow starts! 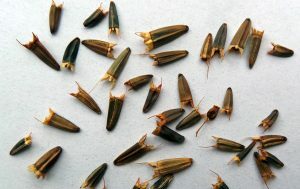 A plant website states that if we are in zone 6 or less, we may need to start these seeds indoors. If they can be grown in Racine, I should be able to grow them in Central Wisconsin also. There is tithonia at the Lynden Sculture Gardens in River Hills. It is quite large with lots of foliage but not many flowers. The flowers that are in bloom are gorgeous, deep orange and stunning. Glad to know that there are a few shorter versions as I would love to try one in my small garden. I love Mexican sunflower and so do the hundreds of Monarch Butterflies that I release. Make sure I start from seed every spring. Planted the Mexican sunflower this year along with sweet corn. Sunflowers grew to 8ft. tall. Taller than the corn. Still looks great. See lots of goldfinch feeding on them. Great addition to my butterfly garden! I’d love to locate some of the shorter cultivars. I love the bright color of the Mexican sunflower but my garden would not handle this very tall plant. Not only do the monarchs love’em so do the hummingbirds! I plant from seed outside after last frost. The short variety blooms a bit earlier while the taller variety takes a bit longer; nice way to have a longer season. I plant next to a larger shrub in full sun to give the Tithonia a bit of protection and support. Very pretty, but very large plant. Interesting to read about but with my tiny city lot would be overwhelming. These can be sen at the Dousman Stagecoach Inn. Lovely! I was told they were purchased from Shady Lane Nursery. This looks like an interesting flower for my upper garden that gets a lot of sun and in our sandy soil, dries out quickly. I would probably plant them against my fence for support as they grow so tall, and is protected a bit from the wind by a maple tree to the north, and our house to the east. Also, is deer resistant, always looking for something the deer don’t like! I have never seen these at any nurseries or garden centers around here. I’m assuming if I wanted to grow them I would have to order a seed packet. But then sounds like I can harvest the seeds after that. I wonder if they will self-seed and grow on their own in the garden like nigella does. Milaegar’s in Racine had them in 4″ pots this Spring.